Richard Art Hambleton (June 23, 1952 – October 29, 2017) was a Canadian artist known for his work as a street artist. He was a surviving member of a group that emerged from the New York City art scene during the booming art market of the 1980s, which also included Keith Haring and Jean-Michel Basquiat. Hambleton was born on June 23, 1952 in Vancouver, British Columbia. He received an Advanced Diploma from the Vancouver School of Art in Vancouver in 1975. Concomitantly Hambleton founded and became a co-director of Pumps Centre for Alternative Art, a gallery, performance and video space in Vancouver. Hambleton's early public art included his Image Mass Murder art. From 1976 to 1978 Hambleton painted a police "chalk" outline around bodies of volunteer "homicide victims." He then splashed some red paint on the outline, leaving behind a realistic looking crime scene. These "crime scenes" were done on the streets of 15 major cities across the United States and Canada. Like Hambleton's future "Shadowman" paintings, the Image Mass Murder "crime scenes" would often have the effect of startling or shocking passersby. In 1979 Hambleton moved permanently to the Lower East Side of New York. It was in New York that Hambleton gained notoriety for his "Shadowman" paintings of the early 1980s. Each painting resembles a life-sized silhouetted image of some mysterious person, a "splashy shadow figure." These "shadow paintings" were splashed and brushed with black paint on hundreds of buildings and other structures across New York City. Locations were believed to be calculated for maximum impact upon unsuspecting pedestrians. Very often, a "Shadowman" could be found in a dark alley or lurking just around a street corner. Hambleton later expanded the scope of his project and painted these "shadowmen" in other cities, including Paris, London and Rome, and in 1984 he painted 17 life-size figures on the East side of the Berlin Wall, returning a year later to paint more figures on the West side of the wall. In 1983, during Malcolm McLaren's fashion design partnership with Vivienne Westwood, they collaborated with Hambleton to create a "Shadowman" jersey skirt. After his public art, Hambleton produced a variation of his "shadow" work, showing his "Shadowman" as a sort of "rodeo man", or rugged "Marlboro Man", often riding a bucking horse. This series was painted on canvas and other materials, where they could be displayed as works of art. Inspired by the Marlboro (cigarette) magazine advertisements, which in some ways exploited the image of a uniquely "American hero" to sell its product, Hambleton appropriated and modified the image to create a new series of work. Hambleton then produced a series of pieces titled "Beautiful Paintings." With strong use of color, these pieces are very different to his "shadow" work. Hambleton stated that this work was a reaction against the abundance of figurative painting displayed in galleries at the time, to which he chose not include figurative work of his own. Hambleton said that he also intentionally sought out a different mood, "with a different sensibility," from his previous work. During his career, Hambleton's works have been shown internationally, including paintings on canvas and paper of his "shadow" work. He was included in the Venice Biennale in 1984 and 1988. In 2009 from September 15, the works of Hambleton were displayed in an exhibition pertaining to 40-year career entitled, "Richard Hambleton - New York." Thirty five pieces of Hambleton's work, spanning from the early 1980s to the present were exhibited, showing his "Shadowman" and "Marlboro Man" works on canvas (and other materials), presented side-by-side with his "Beautiful Paintings." The exhibition toured to multiple venues that included the Moscow Museum of Modern Art. At the 2010 annual AIDS charity amfAR dinner party, held during the Cannes Film Festival, two of Hambleton's painting were auctioned for a combined $920,000.00, to help raise funds for AIDS research. "Shadowman", a film about Hambleton by director Oren Jacoby, premiered at the Tribeca Film Festival on April 21 2017. The film covers his meteoric rise to success in the New York art scene, as well as his widely reported struggle with drug addiction. Hambleton died on October 29, 2017 of cancer at the age of 65. ^ Network, Government of Canada, Canadian Heritage, Canadian Heritage Information. "Artists in Canada". 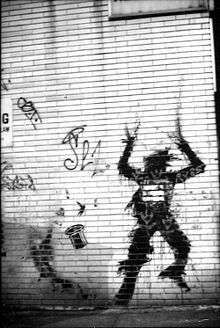 ^ Anon., Rest In Peace—Richard Hambleton, ilovegraffiti.de, Oct 2017. ^ "Richard Hambleton, Street Artist of Shadowy Silhouettes, Dies at 65". artnet News. 2017-10-31. Retrieved 2017-10-31. ^ "The street art of Richard Hambleton". 23 November 2010. ^ a b "Hambleton-Palaia street art". ^ a b Laneri, Raquel (15 April 2017). "The epic rise and disgusting flameout of the artist who ruled 80s New York". ^ Sandomir, Richard (3 November 2017). "Richard Hambleton, 'Shadowman' of the '80s Art Scene, Dies at 65" – via www.nytimes.com. ^ Vancouver Art Gallery (1983). Vancouver, Art and Artists, 1931-1983. Vancouver Art Gallery. ISBN 978-0-920095-00-3. ^ Barry Walker (1986). Public and private: American prints today : 24th National Print Exhibition. Brooklyn Museum. ^ Portfolio. Grosvenor Publications. 1982. ^ a b "Richard Hambleton - artnet". ^ Anthony Haden-Guest (September 1998). True Colors: The Real Life of the Art World. Atlantic Monthly Press. pp. 125–. ISBN 978-0-87113-725-8. ^ "Vanguard article written by Christopher Dewdney May 1982". ^ a b c d e "Video News". ^ Judith R. Halasz (11 February 2015). The Bohemian Ethos: Questioning Work and Making a Scene on the Lower East Side. Routledge. pp. 167–. ISBN 978-1-135-01029-4. ^ "Shadowman photos by photographer Hank O'Neal". ^ "Art Crimes: Berlin 3". ^ "Arts & Books". The Independent. 23 November 2010. pp. 18–19. ^ "Richard Hambleton + Malcolm McLaren = Witches x The Shadow Man". ^ "Richard Hambleton Biography – Richard Hambleton on artnet". ^ "Richard HambletonThe Beautiful Paintings". ^ "richard hambleton new york". 26 February 2010. ^ a b "Artnet News: O'Keeffe biopic, Richard Hambleton is back, new art school in India - artnet Magazine". ^ "Cannes stars turn out for glitzy AIDS charity bash". 21 May 2017 – via Reuters. ^ "Tribeca 2017 Announces Feature Film Line Up for Competition, Spotlight, Viewpoints, and Midnight Sections - Tribeca". ^ a b "'Shadowman': Tribeca Review". ^ "Art drama muscles in on documentary at the Tribeca Film Festival". ^ "Morning Links: David Salle in Kansas Edition - ARTnews". ^ "The Rise and Fall of a 1980s Street Art Star". 21 April 2017. ^ Acevedo, Yoselin. "Shadowman Clip: Tribeca Documentary Explores Life of Richard Hambleton - IndieWire". www.indiewire.com. ^ "Before Banksy and Basquiat, There Was Shadowman". 21 April 2017. ^ Haden-Guest, A., “Richard Hambleton: The Life and Death of a Downtown Art Star”, The Daily Beast, Nov 4, 2017. This page was last edited on 22 January 2019, at 14:52 (UTC).